Do I need to adjust anything? Is there anything glaringly obvious that Im missing? She runs well as far as Im concerned, barring occasionally misfiring (that one Im pretty sure is due to a slightly clogged emusion tube). Do I need to adjust my carbs more? I'd check the sync between 2&3, and do another idle drop adjustment. 3&4 look good for 6K, 1&2 are a little dark, with 1 being more so. The only way to really know is put in the new plugs, run it for just a little bit, and do a throttle chop test. If it was me, I'd do one at about 3-4K, and a second at about 7K. This way you can check midrange and main jets. I know, it's not the pull hard to 8K and chop as some people do, but I like to have my bike running well at low RPM's as well as high. Guess it depends on how picky you want to be. Some riders would love to have plugs looking that good. So the bike starts well both Cold start & Hot start without any issues? How much oil did you use in that 6K of use? #4 & #3 have that nice tan color so those are fine. #1 looks a bit black but some of that could be the light angle of the pic. But it looks like there is some brownish color up the insulator. I assume you are parking the bike for the winter? I'd carefully drain the carb bowls and see how much crud is in there. Those bowl drain washers get mangled up so be careful if you don't have new ones on hand. Let's see what the others say. Oh, running inline gas filters? So kind of depends. Hate to get into something that's working. Depends too on the miles you expect to ride in 2019. Ditto on what DiverRay said. Depends on the tools and how close to perfect you want it. Im going through oil kinda quick, but I have a tensioner leak that Ill be sorting over the winter. Inline filters are a yes. And it starts well enough. I plan on many more miles next year. Planning a NYC to LA and back next summer. No 2 does look oil-fouled to some extent. You can go to a hotter plug like a BP6ES instead of standard BP7ES. Also, I have found that using NeverSeize can make the plugs turn black. I do recommend that stuff (but go lightly) because you do not want the threads to become "one" with the aluminum of the head! The hard thing about looking at plugs is we don't know what they were subjected to before you pulled them for a look. For example excessive idling or highway conditions. Adjusting carbs without taking that into consideration can yield bad results. If your bike smokes on deceleration, it could be due to a bad valve seal -- nothing to do with carb adjustments! I would carry a spare set of plugs for a long trip in case ignition starts dropping out. Also, I agree that rechecking synch is a good plan. Oil fouling is possible, but it wouldnt be valve seals. New seals and head gasket 2 years ago, and well kept since. New coils and resistor delete when the plugs were replaced in the spring. Would bad rings cause oil fouling without noticable compression loss? For winter, first order of business IMO would be to 'scrap' the stock cam chain tensioner. Poor design and the what's called the tensioner lock bolt will NOT hold tensioner in place. Too much load force from chain under a hard decell. Replace that tensioner with an auto tensioner, preferably one of the two from a Yamaha Venture 1200 V-4. No more leak nor adjustment needed ever. 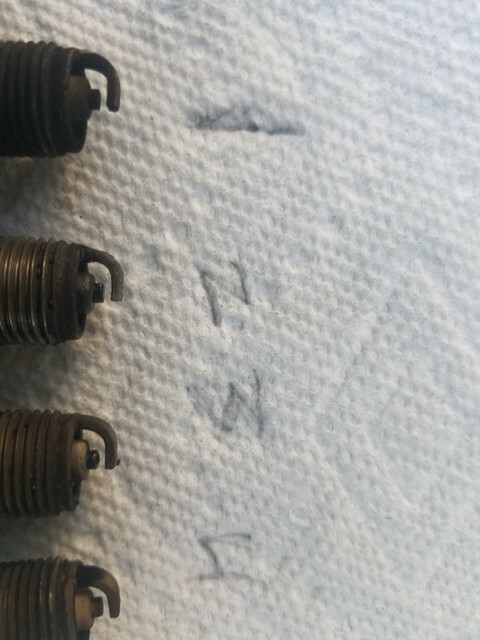 Leak issue from stock tensioner normally comes from plugged end of tensioner, and that plug has been known to get blown out of housing. Many options for a fix have already been tried over the years with minimal success. To top that, tensioner lock bolt used is NOT an actual pinch retainer type lock bolt. Stock pinch bolt does not have necessary recess in order for bolt-end to have a circular sharp edge, and also is normally a grade #8 lock/pinch bolt. Do a little research on the install. I did it and the mounting bolts need to be a bit shorter than stock to prevent them from bottoming out. Good reminder Sid. If possible, get the two allen bolts WITH the auto adjuster, as they are the correct length. I have already purchased a acct with bolts. Thats on my winter list, thus I have no concerns about the leaking. About 2 years ago, my cct blew out and bent 4 valves, so that was added to the priority list for the next time the fairing comes off.